Know for certain, least of my sons, that I am the perfect and perpetual Virgin Mary, Mother of the True God through whom everything lives, the Lord of all things near and far, the Master of heaven and earth. It is my earnest wish that a temple be built here to my honor. Here I will demonstrate, I will exhibit, I will give all my love, my compassion, my help and my protection to people. I am your merciful mother, the merciful mother of all of you who live united in this land, and of all mankind, of all those who love me, of those who cry to me, of those who seek me, of those who have confidence in me. Here I will hear their weeping, their sorrow, and will remedy, and alleviate all their multiple sufferings, necessities and misfortunes. 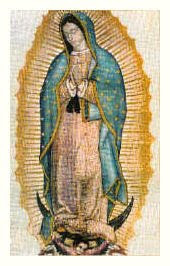 Words of Our Lady of Guadalupe to Juan Diego on December 9, 1531. Our Lady of Guadalupe, Ever Virgin, mother of the True God, Woman clothed with the Sun, I totally consecrate myself to you and to your Sorrowful and Immaculate Heart. Holy Archangel Gabriel who presented to us the beauty and virtues of Mary’s should [Lk. 1:26-35] obtain for me the grace to imitate these virtues and, by my example, to show others how to live, how to love, how to sacrifice and how to die. I consecrate to you, Protectress of the Unborn, my work of protecting the sacredness of all human life from conception to natural death; my work in spreading the Good News; and my work in renewing and protecting the sanctity of the family. I ask for the special protection of the Infant Jesus, of you His Mother, and of St. Joseph, guardian of the Holy Family of Nazareth. In reparation I will pray and sacrifice. Please pray for us who seek refuge in you, for the conversion of poor sinners who offend you and for the salvation of all souls! I promise to keep ever before me your instructions at the Wedding Feast at Cana, Do whatever He tells you." [Jn. 2:5] In doing so I will be loyal and obedient to the Pope, your first son on earth. I am sure in my consecration to you that you will lead me on a safe and sure path to the Sacred Heart of Jesus. Holy Mother of God, save us through the Flame of Love of your Sorrowful and Immaculate Heart! Send forth the grace from your Flame of Love to the whole human race now and at the hour of our death. Send forth your Spouse, the Holy Spirit, to bring us the New Pentecost and the fire of His Divine Love to renew the face of the earth. O Mother of Mercy, let there be revealed, once more, in the history of the world the infinite power of merciful love! May it put an end to evil. May it transform consciences. May your Sorrowful and Immaculate Heart reveal for all the light of faith, hope and love. May Christ the King reign over us, our families, cities, states, nations and the whole of humanity. Dear Lady of Guadalupe, I conclude my consecration to you with the message you gave to Blessed Juan Diego in Mexico on Tepeyac Hill in 1531 hereby accepting it also as a message from you to me. Know for certain that I am the perfect and perpetual Virgin Mary, Mother of the True God. Here I will show and offer all my love, my compassion, my help and protection to the people. I am your merciful Mother, the Mother of all who love me, of those who cry to me, of those who have confidence in me. Here I will hear their weeping and their sorrows and will remedy and alleviate their suffering, necessities and misfortunes… Listen and let it penetrate your heart… Do not be troubled or weighed down with grief. Do not fear any illness or vexations, anxiety or pain. Am I not here who am your Mother? Are you not under my shadow and protection? Am I not your fountain of life? Are you not in the folds of my mantle? In the crossing of my arms? Is there anything else you need? Mary Our Blessed Mother! Pray for us! The Catholic Church in the Democratic Republic of Congo is in shock after the brutal killing of a priest and a nun in two separate attacks. Father Daniel Cizimya Nakamaga, 51, was shot in the head in the early hours of Sunday, December 6th, when gunman broke into the presbytery of Kabare, 9 miles outside Bukavu, a city in the east of the country. Less than 48 hours later, again just north of Bukavu, attackers struck at a Trappist monastery, killing Sister Denise Kahambu. A third person died when police trying to catch the killers opened fire on a car containing three potential suspects who were driving through the area late at night. The killings bring to a head a growing wave of violence and tension in the region, directed – at least in part – at Christians. Describing the killing of Fr. Cizimya, the vicar general went on to describe how armed men stormed the presbytery in Kabare, eventually smashing a window to get inside. The attackers made for Fr. Cizimya’s room, but when he tried to close the door to keep them out, they fired two shots at his head, killing him instantly. In a report sent to ACN, Fr. Bunyakiri Crispin, Rector of St. Pius X Seminary, Murhesa, 15 miles outside Bukavu, described responding to an emergency cry for help from the nearby Trappist monastery, where Sr. Denise had just been shot. He reported that witnesses described how Sr. Denise, who was guest mistress at the monastery, was suddenly confronted by three strangers. She tried to escape but was shot dead. Another woman, who works at the monastery, described how the attackers demanded money from her. When she refused the attacker fired a gun at her but missed. The rest of the nuns – who eventually phoned him for help – took shelter in the monastery dormitory, sitting on the floor in case shots were fired through the windows. Msgr. Bulambo reported that police were continuing their inquiries but added that two of the suspects in the car that came under police fire were able to escape. He went on to hint at possible collusion between security staff officials and the attackers. Msgr. Bulambo said that the incidents were the latest in a series of attacks on Church communities in the Bukavu area. Fr. Crispin stated that this was the fourth time the Trappist nuns had been attacked since 1996. Describing the Church as “in the eye of the storm,” Msgr. Bulambo recalled that two months ago two priests in Ciherano were “imprisoned like rats” by attackers who set fire to their presbytery. A few days later, a group of students were robbed. At about the same time a hospital in Mukongola was burgled. Aid to the Church in Need (ACN), which last year gave over $3.1 million to help persecuted and other suffering Christians in DR Congo, has reacted with deep concern to the killings, which come shortly after a project assessment trip to the region. The charity gives major support to the Bukavu-based Daughters of the Resurrection, a religious order co-founded by ACN founder Fr. Werenfried van Straaten. The Daughters’ Mother House is located less than two miles from the Trappist Monastery. "My name is Florence. I am a child of God. I do God's will." Although this book was written about and by a Catholic woman born and raised in Hawaii , I would not have known about it if it were not for one of my dear friends now deceased whose book I now own. Soul Within a Peach is about the life, especially the spiritual life of Florence Sau Kin. It was ghost-written by her spiritual son Fr. Francis Chun, a Catholic priest in Milwaukee . In the beginning Florence talks about her life as a child. She was born in Hawaii to Chinese parents and raised a Buddhist. The way she relates her difficult early childhood is reminiscent of the old tragic Chinese novels and films. It is more a story of old China than it is about someone in Hawaii, even before Statehood. Even as a young child, many people, especially members of her own family took advantage of young Florence. "I never realized how hard my life was as a child and teenager until I began writing this book for God. My suffering in life began in childhood and continued throughout my life. Suffering has made me a strong woman, brought me closer to God, and taught me His spiritual lessons, which I want to share with you." I will share one incident here to illustrate what little Florence had to endure at the hands of a family member. One of her father's sisters had a very sick husband. He was admitted to the hospital's tuberculosis ward. Since this aunt did not have any children of her own, she asked Florence's parents to let Florence keep her company. Amazingly, Florence's parents acquiesced to such a request and she ended up living with the aunt from ages five to eight.
."..The Chinese children of my generation were taught to obey without questioning. My time spent with my aunt was work. She made me do the dishes, dust the furniture and go on my knees to clean the wooden floor around the Chinese rugs with a dust pan and brush. If she found a dust speck, she made me dust everything again. She never allowed me to go out to play with the neighbors' children. Sometimes she punished me without reason by not giving me supper. The Chinese children of my generation were taught to obey without questioning, and God had made my soul an obedient one. So I learned to obey at a young age." Later, this same aunt without Florence's prior knowledge or consent, would take Florence to China to live for a few years. The aunt somehow convinced Florence's parents to again part with their daughter. Florence, obedient child of God, accepted these hardships early in life. These experience helped form her spiritually little by little. It was while living in China that a medium revealed to Florence that she had "sin kwat" or saintly bones. Florence explains that "Sin Kwat, saintly bones, can have two Chinese meanings: that the spirit of a saint has been reincarnated in the form of this person; or that this person is saintly herself." No need to explain that it is sinful for Catholics to believe in fortunetellers, reincarnation, etc. but at the time, Florence as a Buddhist as aforesaid and this is what she remembered. The years went on and she met a man who ultimately, but not through the best of situations became her husband. Her husband and his family were Catholic. He graduated from St. Louis School in Honolulu. Even though her married life was also a struggle and very difficult because of her husband and his family, it led her to the Catholic Church. Florence had only a second grade education. Yet more importantly, she had great wisdom, a gift from the Holy Spirit, with whom she had a special relationship with, and much common sense. Throughout the book, Florence often refers to the "inner voice" speaking to her. She was a kind woman who was dedicated to her husband, children, the stereotypically mean and unjust mother-in-law and everyone who asked for her help. Many times people sullied her reputation or took advantage of her open-handed and openhearted generosity. Yet, each bad episode she took as a learning experience. She offered her sufferings to God and was always obedient to Him. She did not care how much she suffered as long as she did not offend God. As I mentioned earlier, Florence had a ghostwriter because she lost her eyesight later in life. Father Chun did a very good job of writing the book without losing Florence's spirit of playfulness and child-like quality. Many times in the book I would laugh at incidents Florence shares. Many times too I wanted to smack some sense into Florence especially when she permitted others to take advantage of her kindness. Whenever Florence shares a moment where she was hurt or suffered from someone's inconsiderateness, she shares a lesson for the reader. To share an example, Florence was a big promoter of the Home Enthronement to the Sacred Heart of Jesus. Father Mateo Crawley-Boevey, a Sacred Hearts priest and member of the same order as Saint Damien, originated that devotion. She wanted everyone whom she helped enthrone their home, to spread the devotion to others. "...I later learned that Dora never spread the Enthronement to other homes according to our agreement and plan. Through the years I've learned that many people perform religious acts to gain respect and praise for themselves instead of doing them to honor and praise God. When you take part in religious ceremonies, be sure to do so to give due thanks, honor and glory to God, and not for selfish reasons. Many of us don't share our spiritual blessing with others. A true Christian life is a life of sharing, so we shouldn't keep good things just for ourselves. I tried to s hare the many blessings of the Enthronement with others because it was one of the greatest blessings I received from God. Having it in our home deepened our faith and reliance on God. If we welcome God into our homes ad hearts with love and gratitude, we will experience His presence and love in a special way through many special blessings." I also found this book very interesting because of the places Florence described are all around my new hometown of Honolulu. She mentions certain churches, streets, etc. that are all very familiar to me. It is sad that Florence passed away in 2000 before her book was published. I now wonder if I may have attended Mass or a Catholic function with her. I have asked a few people I know if they knew her but so far, I have to yet meet anyone who knew this amazingly simple yet saintly woman. I know my son's now deceased Godmother probably knew her since they both raised their families close by or the friend whose book I now have. But right now it is too late to ask them. If you would like to obtain this book, be sure to check out Amazon.com. My mother read the book before me and she could not put it down. She bought two copies from Amazon and each one cost under $5.00 with shipping and handling. "...Oh my Mother, how ashamed I feel in your presence, weighted down as I am with faults! You are most pure and immaculate from the moment in eternity when you were conceived in the mind of God. Have pity on me! May one compassionate look of yours revive me, purify me, and lift me up to God; raising me from the filth of this world that I may go to him who created me, who regenerated me in Holy Baptism, giving me back my white stole of innocence that original sin had so defiled. Dear Mother, make me love him! Pour into my heart that love that burned in yours for him. Even though I be clothed in misery, I revere the mystery of your Immaculate Conception, and I ardently wish that through it you may purify my heart so that I may love your God and my God. Cleanse my mind that it may reach up to him and contemplate him and adore him in spirit and in truth. Purify my body that I too may be a tabernacle for him and be less unworthy of possessing him when he deigns to come to me in Holy Communion. Christmas is around the corner and we realize how difficult it can be to pause and reflect with your family and children about the true spirit of Christmas. To make it easier for you, we created an attractive online storybook on the life of Saint Nicholas. It is fun, colorful and inspirational! Discover the real story behind the Santa Claus legend through this FREE attractive online storybook! Catholic Heroes of the Faith presents the life story of Saint Nicholas, a young, wealthy boy who after becoming an orphan found joy in serving the most needy. Born in Turkey to a wealthy and devoted Christian family, Nicholas’ faith was challenged with the sudden death of his parents. Struggling in his loss, Nicholas soon discovered great joy when he began using his inherited wealth as a means to alleviate the hardships in the lives of others less fortunate. Moved by a profound love for Christ and the poor, Nicholas distributed his inheritance among the needy, the sick, and the suffering. Thus Nicholas soon became known as the joyful giver of gifts! Make this holiday season a special occasion as you enjoy the web-based story of this great Catholic hero and let your lives be challenged by his example of joyful generosity! And don’t forget your friends! Help us promote this inspirational resource by posting our link on your blog. We thank you in advance. More About "Catholic Heroes of the Faith"
Catholic Heroes of the Faith is an animated series, geared primarily to children 8-12 years of age, which presents true-life accounts of outstanding early church heroes of the Catholic faith. “The Story of Saint Perpetua” is the inaugural episode of the series. When kids see what God can do through a person devoted to His will and purposes, they too may want to demonstrate an unswerving commitment to Christ and His Church. “Well done and quite inspirational! I was very impressed indeed, both with the historical accuracy of the content and with the entertainment value.” Rod Bennett - Author of "Four Witnesses: The Early Church in Her Own Words."